#4......"WEEKEND IN THE COUNTRY" - BODIE 3.7 . you'll never walk alone ! mmmm this image of Bodie with camo jacket and bare arms not to mention grease and concententration makes me *swoon* every time i see it , yum , yum , yum . Glad you like it and thankyou for looking . A fantastic photo and I love seeing his bare arms at work! Thank you. thankyou , yes i love seeing his bare arms at work too especially when they are covered in oil and grease . Glad you like this and thankyou for looking . I like this ep :) Thank you! 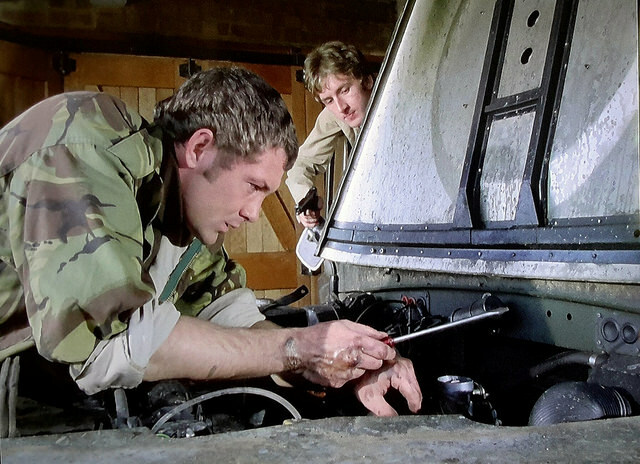 oh me too , i don't enjoy it as much as "fugitive" but i do enjoy watching Bodie at his most angry and especially when his bare arms are on show when he's fixing the car *massive sigh*. Thankyou so much for looking at this . *swoon* also , i was never going to leave this scene out especially with Bodie showing those bare arms and elbow deep in oil and grease and that jacket ...lots and lots to admire and he's not very happy which is another reason for liking him here . Thankyou so much for looking at this . thankyou , yes it's lovely to see Bodie knowing just as much as Doyle does around a car engine . Those bare arms are a joy to watch especially as he's elbow deep in grease and oil and that jacket , yes lots to admire in this scene . Thankyou so much for looking at this .